I do take a lot of photos, and I have always taken many photos for my children’s classes – you know…Historical Fiction Character Day, Valentine’s Day Booth photos, and class photos for end of year teacher gifts. However, I had never really done an official Senior Photo Shoot. This particular teacher teaches Kindergarten, and I have taken lots of photos for their team over the years. It’s always a happy day when they ask me to come photograph their cute little kiddos for a Mother’s Day gift, or some other Kinder project. It makes me so happy to see their little smiling faces. So she knew I had a pretty decent camera, and from being my friend on Facebook, she knew that I LOVE to take pictures. Absolutely love having a senior hold one of their baby pictures! But adding the ballet slippers made it even more special! But…I still wasn’t sure how to answer her. I had taken Senior Photos for my sister’s children when they were seniors, and a few other relatives, but I had never branched out from my own family. This would be a first real “Senior Photo Shoot” for me. I was excited and nervous at the same time. Plus…I had never met her daughter, Avery before. We finally found a date that worked for everyone, and we decided to meet after school about 4:00. Wouldn’t you know it – crazy Texas weather took hold, and we woke up to thunderstorms and pouring rain! Oh no… I do not do well with flashes, so I decided to set up a make-shift studio on my garage. I spent about 2 hours setting up light and backdrops, and by the time I finished, I felt like I had a pretty good set up. But as all of you with cameras know, indoor (or garage) pictures never look quite as good as those with natural light. I was very nervous about shooting in my garage for many reasons – it was very muggy outside, I had not used this light set up many times before, and I felt like the poses and styles would be so limited inside without any props. Just a quick costume change and we had an entire new set of photos for her to choose from! And I don’t know how she was able to hold this pose for so long while I adjusted my camera settings! As luck would have it, about 15 minutes before we were to meet, the sun peeked out from behind the clouds, and the rain stopped! I was saved. But now, I had to make sure that we could find a dry enough spot for the shoot. We decided to meet out behind a local elementary school in a big field with lots of trees and small brick walls to sit on. It turned out to be perfect! Well…it was hot and muggy, but the backdrop for the pictures was beautiful. For this shoot, we stayed at the same location. 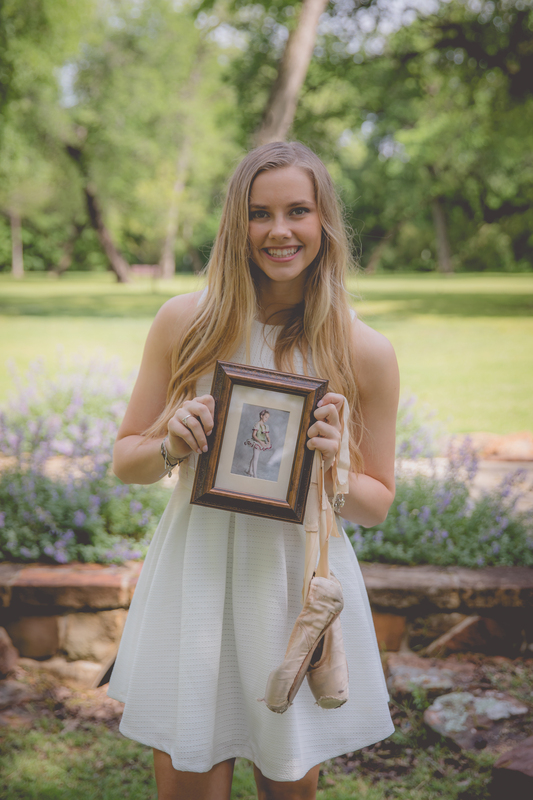 But, Avery is a dancer, so she brought a few outfits with her – a dancing outfit (and ballet shoes), a college t-shirt, a dress, and of course my favorite prop of all, a baby picture. The session was a success – bad weather and all! A few months after this photoshoot, another friend contacted me and asked if I would do senior photos for her son too. At this point, I had a few of these sessions under my belt, so I was excited to do another one. For Hunter’s session, we went to multiple locations. This was my first time to “travel” for a Senior Photo Session. It was so fun. The result was great – it looked like we had taken pictures on several different occasions. We decided to take another baby picture photo on the graffiti tracks. Not only did we take them at different spots, but he changed clothes and had many different props for his session. Hunter was a football and basketball player, so we had many things to choose from. We took a few shots behind the elementary school he attended, and then we moved on to the graffiti tracks here near my house. It didn’t have a particular meaning for him, but all the colors just make for a cool location. However, my favorite part of Hunter’s session was when we went over to the football stadium. Unfortunately, the stadium was locked so we weren’t able to get in, but we did get some neat shots outside of the stadium. What I liked best about this part of his photoshoot is how comfortable he became when we were at the stadium. I could tell how much this place had meant to him – it showed in his eyes and his smile! Don’t get me wrong – he had been relaxed and easy to photograph the entire time, but there was just something special about being at the stadium. Each time I head out on one of these sessions, it seems that I learn something new. Sometimes new poses or props to have them bring to the shoot, and sometimes more practical things like bring a hairbrush and hairspray! Let me know if you have anything to add to this list below. Remind your client to bring a brush and some hairspray (especially girls). Towels/blankets to sit on are nice if you are planning to have them sit on the ground. Pack an extra battery and memory card for your camera. Have a couple of lenses with you. Especially if you are going to several locations. Never know what lens might work best until you are there..
Bluetooth speaker for music – I’ve never done this, but I know several people who do this just in case your client is nervous or uptight. I’ve heard it helps to relax them. Bring a flash – on Avery’s photoshoot, there were several places that were kind of dark (due to the weather), and a little bit of flash-fill would’ve been perfect. Allow time to take a few cell phone pics for the parents – since editing pictures takes a while, a cute little cell phone pic is sometimes nice. Both sessions were great, and it was fun to see the difference between taking photos of a senior boy and a senior girl. As the mom of a boy and a girl, it didn’t surprise me how different the two were. Both wonderful in their own way.